Newsletter "Juntos (together)" Vol.19 of flood-hit Joso community just published! 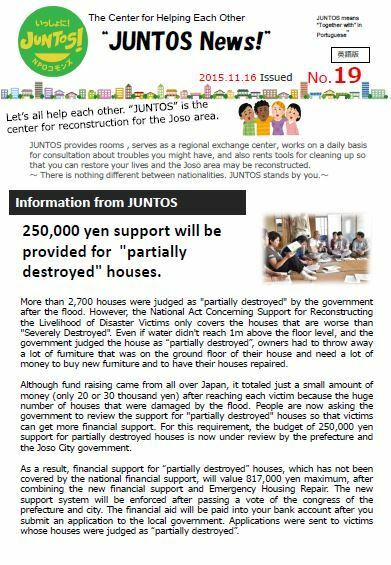 HOME >> トピックス >> Newsletter "Juntos (together)" Vol.19 of flood-hit Joso community just published! It has been very difficult for people in flood-hit Joso to obtain information necessary for them. There are a lot of people who feel difficulty to get information. People in evacuation centers. People who are not familiar with Internet. People who use languages other than Japanese. People who get confused with many rumors. So we have been publishing a newsletter called "Juntos," meaning "together" in Portuguese, almost every day to provide information needed for afflicted people, such as information of how to rent tools necessary to clean up houses with dirt, information of volunteers, etc. We have also published it in other languages such as Portuguese, English, Chinese and Spanish in order to provide information to people from other countries like Brazil and Philippines. While we hand out the newsletter, we listen to the voices of afflicted people in Mitsukaido, Joso, around the office of Commons and people in evacuation centers, and use them to brush up the contents of the newsletter. Click here to download Newsletter "Juntos" Vol.19 (PDF:909KB)! ※ Click here to download Newsletter "Juntos" special edition (PDF:1.3MB)! ※ Click here to download Newsletter "Juntos" Vol.15 (PDF:589KB)! ※ Click here to download Newsletter "Juntos" Vol.14 (PDF:586KB)! ※ Click here to download Newsletter "Juntos" Vol.13 (PDF:626KB)! ※ Click here to download Newsletter "Juntos" Vol.11 (PDF:508KB)! ※ Click here to download Newsletter "Juntos" Vol.10 (PDF:499KB)! ※ Click here to download Newsletter "Juntos" Vol.7 (PDF:614KB)! ※ Click here to download Newsletter "Juntos" Vol.6 (PDF:641KB)! ※ Click here to download Newsletter "Juntos" Vol.5 (PDF:603KB)! ※ Click here to download Newsletter "Juntos" Vol.4 (PDF:953KB)!